Eugene Peterson’s book Run with the Horses has been around for a long time, but I didn’t pick it up until I was so powerfully struck by Jeremiah 12:5, the verse from which the book’s title is derived. This has become a bit of a “life-verse” for me, one that has struck me time and again when faced with anger or despair. 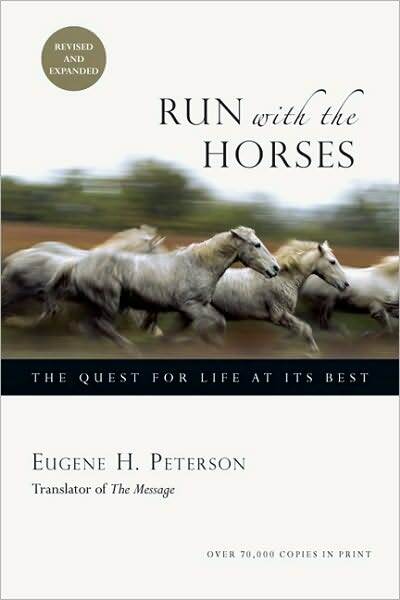 Run with the Horses is a pastoral commentary on the book of Jeremiah. It is not exhaustive, though it covers the most significant events of Jeremiah’s life and ministry. The book is subtitled “The Quest for Life at Its Best”, which is subversive because few of us would like at Jeremiah’s life with envy. He was a melancholy outcast who struggled mightily with the weight of his calling and the resistance with which it was met. He lived through the most trying period in his nation’s history, and ultimately died an ignoble death in a foreign land. That is the question, as Peterson sees it, that God posed to Jeremiah. It is the same question he now poses to us. We can get worn out by this life, bitterly devolving into a grumbling mass; or we can step outside the rat race to where the thoroughbreds run and test our legs there. “Some people as they grow up become less. …Other people as they grow up become more. Life is not an inevitable decline into dullness; for some it is an ascent into excellence.” (25) Such was the path of Jeremiah. Peterson sketches Jeremiah’s faithfulness to God through all the horrors of his life: mockery, rejection, famine, siege, desolation, and exile. 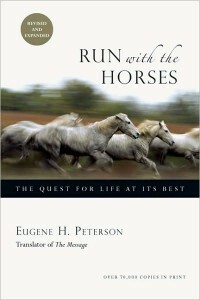 Through it all he chose to run with the horses, to not be sidetracked by bitterness or disappointment. He was melancholy, but still he hoped in God. This is an excellent book for everyone, but especially for those pursuing full-time vocational ministry. There is much to be learned from Jeremiah’s life and ministry, particularly for those of us who would dare to speak God’s message.